Jacinto City, TX. — Saturday, April 7, 2018 — Volunteers of two organizations kicked off the city’s annual cleanup campaign. 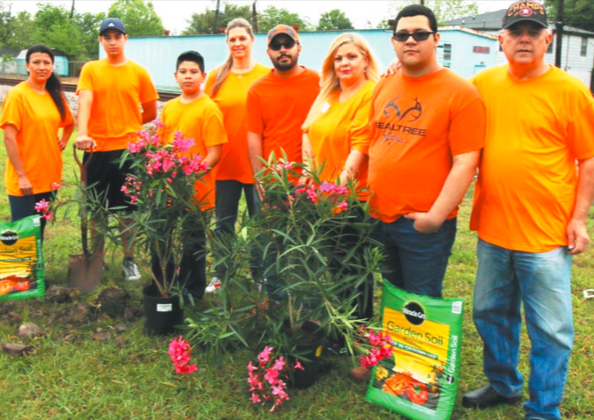 A new group of volunteers going by the name of “DON’T BE MEAN, KEEP TEXAS CLEAN” (DBMKTC) joined forces with the Keep Jacinto City Clean Committee volunteers (KJCCC) to help keep the city cleaner and nicer looking. KJCCC planted Oleanders along Market Street and the DBMKTC picked up litter along a mile of Market Street. City Manger Lon Squyres said to prevent the deadly ZIKA virus, citizens must keep grass and weeds mowed, including their utility easements. The free Annual Tire Roundup Day is scheduled for 8 AM, Saturday, May 19th, and citizens must place the tires out front on the edge of the street. The annual Pet Vaccination Clinic is set from 9 AM to 3 PM, Saturday, April 21, at the Public Works Facility (12202 Market). Jacinto City citizens can get their pets vaccinated at a reduced price and buy the required 2018 Green pet license tags. Squyres said Building Permits is required BEFORE starting any building related projects, including but not limited to roofs, driveways, fences, air condition or heating, electrical and plumbing. Permits must be posted visible from the street or citations and fines can result. L to R: Keep Jacinto City Clean Committee members, President Teresa Arzapala, brothers Jose and Erick Pena, Secretary Linda Jamail, Oziel Salinas Jr, Vice-President Irasema Salinas, Edgar Salinas, Founder Allan Jamail. “When I felt the heart beating, and heard the recipient and his family’s words of gratitude to the heart donor’s parents, I made a commitment to do whatever I could to make this life-extending surgery better known to the citizenry,” Jamail said. 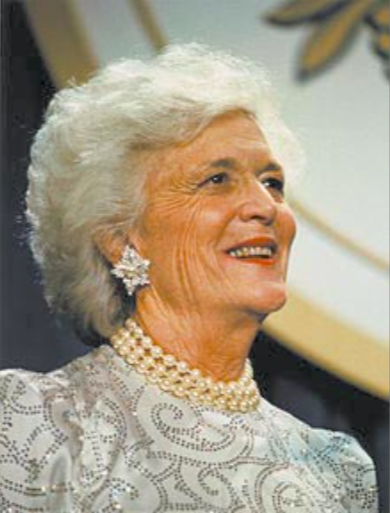 Barbara Bush, well-known for her chartable help, was invited to a Texas style bar-b-q with Country Music in Jacinto City, where the Tensile Town Theater is now located. Television and radio stations advertised Barbara’s coming to the event, as did the newspapers, and it brought public awareness to the organ donating cause. Mayor Jamail introduced Mrs. Bush before she spoke to over a thousand in attendance and gave her a key to the city. “The US Secret Service took her to the awaiting car to take her to the airport. I learned later while on the plane to Washington she personally typed a thank you letter to me,” Jamail recalls. Barbara Bush, the loyal wife of one U.S. president and mother of another, who was a champion of literacy, died Tuesday, April 17, 2018, surrounded by her family at her west Houston home. Jacinto City CVS Pharmacy armed robbery caught on security camera. Jacinto City, TX. – Saturday, April 14, 2018 at 10 PM, as the clerk of the CVS Pharmacy at 10222 East Freeway was closing and locking the doors, gunmen charged into the store, waving handguns and forced the clerk to give them the store’s money. 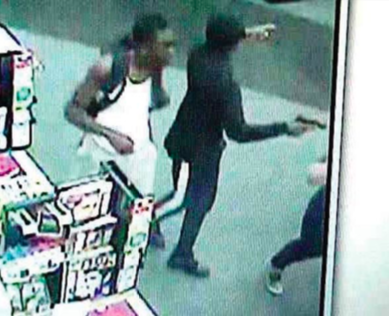 Police arrived at the store after receiving a call from a witness, who said the robbers ran out of the store. One of the officers’s spotted the gunmen running away on foot behind the store. The fleeing suspects got into a vehicle waiting for them, but after a short chase, patrol units caught them. Five male suspects and one female, identified as Madasyn Edwards driving the get-away vehicle, were taken into custody. Officers recovered the weapons and an undetermined amount of cash. All Suspects were charged with Aggravated Robbery.